The 2018 World Cup is coming, enjoy the wonderful time with your family. You will not regret to choose KUAK LED Video projector. KUAK HT30 2200 lumens projector has a projection image size of 32-170", supporting native resolution 800x480P, max resolution 1080P. Perfect for home entertainment, football matches, home cinema, play games, watch movies, view photo and early childhood education. 3.5mm audio jack: headphone/external audio device. Connect with TV Box via HDMI cable, which is equivalent to a big screen TV. More portable when you travel or go out with friends. With the lamp life extended to an impressive 50,000 hours, you could watch 5-hours movie every day and your projector's lamp would still last 20 years. You can use a lightning to HDMI adapter to connect our projector to your iPhone, iPad. For android smartphones, you need to use a wireless HDMI dongle to connect. Adjustment: 15° (vertical) Keystone Correction. 【2018 UPGRADED 2200 LUMENS】KUAK video projector upgraded 2200 lumens with +30% more brighter. Supporting 1920x1080 resolution, 16.7 Million Displayable Colors, Contrast ration 3000:1, Aspect Ratio:4:3/16:9, 50,000 hours lamp lifetime. It's a best choice for movie night with your family. 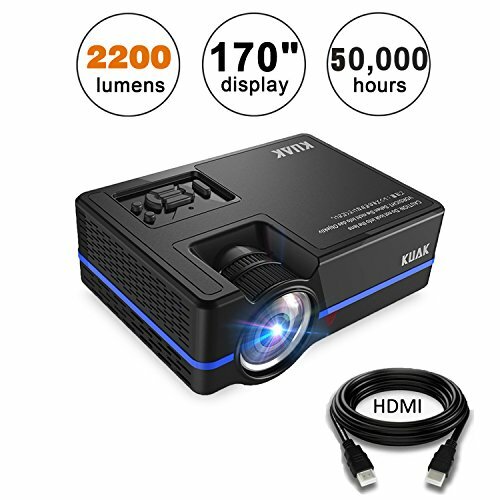 【170" LARGE SCREEN】This mini projector offers you 32-170" inches large screen with projection distance 1.0-5.2m, the best watching distance is 3-3.5m with 130" image. We do NOT recommend it for use in PPT or business presentations. 【MULTIMEDIA PORTABLE PROJECTOR】KUAK mini portable projector supports HDMI/USB/AV/VGA/TV/ Micro SD card and 3.5mm audio port, which allows you to use it for video games device like PS3, PS4, XBOX. It can also work with PCs, laptops, blue-ray DVD players, TV box, Amplifier, Amazon Fire TV Stick, Chromecast. Come with HDMI cable and AV cable. 【IDEAL CHOICE FOR HOME ENTERTAINMENT】2x Speaker 2W, 2x IR Receiver (Front + Rear), the 3.5mm audio jack allows you to connect headphone or external audio device. LED light source and LCD display technology, this ensures no need to replace lamp for 20 years (5 hours/day). LED Great for home cinema, movies & video games. 【100% SATISFACTION GUARANTEE】We offers every customer 100% satisfaction guarantee. 3-year warranty and lifetime professional customer service & technical support. If you have any problems, please feel free to contact us. If you have any questions about this product by KUAK, contact us by completing and submitting the form below. If you are looking for a specif part number, please include it with your message.